Here’s a question for you – how many Windows Explorer windows do you have open at any given time? A lot, right? And yet, it still takes you a while to find the files you need, drilling down through folders. Time to take your file management game to the next level with today’s discount software promotion, Easy Explorer! 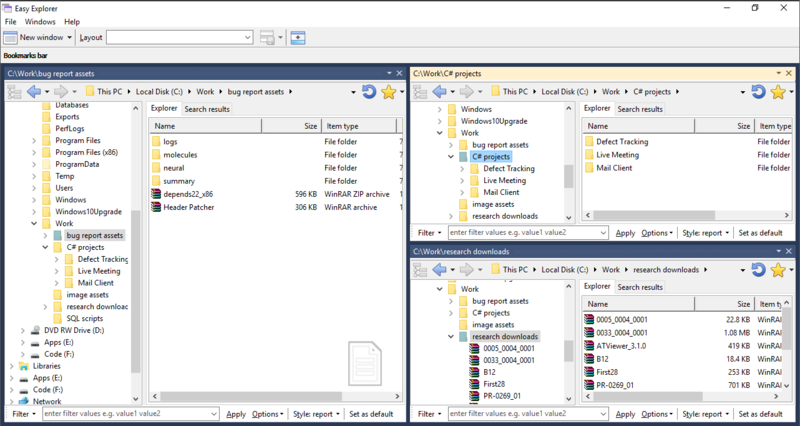 Easy Explorer lets you organize multiple Explorer windows with ease, saving and recalling window layouts quickly and easily. With Easy Explorer, you’ll be able to organize your Explorer windows just the way you like them, then save that configuration as a layout that can be recalled any time you need it. The fun doesn’t end with layouts, though! Easy Explorer offers a bookmarks bar so that you can access frequently used folders with just a click. Imagine having a clean desktop, but still being able to get into your favorite folders quickly! Best of all, you can apply one or more search filters to your Explorer windows to find exactly the files you’re looking for right away. After you purchase Easy Explorer it may be used indefinitely. Easy Explorer is licensed per user, so if more people are going to use Easy Explorer you will need to purchase additional copies. Stephen Warkentien I like to use checkboxes in Windows Explorer. Are they available in Easy Explorer? R W Trial version has to be registered. Couldn't drag files from one window to another. Randal H. I installed the trial, made two window layouts, then tried switching between them. I could switch from one to the other, then back to the first, next attempt to switch to the 2nd layout program crashes. Tried several times including uninstalling and reinstalling - consistently crashes. and contain a 'layout_' prefix. Please also send us the layouts.txt and settings.ini files, to support yohz.com. Thank you. Yeoh Ray Mond Stephen Warkentien - could you please drop us a line at support yohz.com so that we may find out in more detail how and what you use checkboxes for? Thanks. Nico Westerdale Great News! Yohz Ventures Sdn Bhd has agreed to extend this deal for another day - Enjoy! Jon Spain How can one enter license (I bought v2 earlier), please? Yeoh Ray Mond Jon Spain - in the main window, select the Help > Activate license item, and use that Wizard to enter your license key and activate Easy Explorer. Gary User The "search" function appears to only search file names, not content like windows explorer. For example, if you search in windows explorer for "chauffeur" you would get back both files containing "chauffeur" in the name and pdf and word files containing the word "chauffeur". In Easy Explorer's search I only got files containing the "chauffeur" in the name. Yeoh Ray Mond Gary User - Yes, that is correct. Easy Explorer only searches on file and folder names, not the contents of files. Jon Spain Sorry, one other question, please. In order to use my Google Drive, I use ExpanDrive, with which Windows Explorer interacts. However, Easy Explorer can't see that drive; any ideas, please? Yeoh Ray Mond Sorry, but Easy Explorer cannot interact with third-party add-ins to Windows Explorer.